There are a few things that I’ve completely fallen in love with this winter, all of them being clothing related of course, and white denim is possibly number one on the list. I think it’s so fresh and clean and really brings cheerfulness to those cold days. I would love to wear all white during a snowy day but unfortunately it has yet to snow here in Germany so I guess all the snowy looks from New York bloggers will have to suffice for now. I know I’m wearing white jeans but I just had to name this look 50 shades of blue because this outfit contains so much blue. I even thought about wearing blue shoes but at the very last second changed into these new brown loafers of mine. I guess I just couldn’t wait to take them out of the box. They are from a very cool Portuguese brand thats actually called Nobrand. I first heard about them through another blog and because of the interesting name I had to look them up. I was pleasantly surprised when I found these beautiful loafers. I wore them with red socks to bring a little color to the outfit. I would love to know what you guys think about the look. Have a peaceful and relaxing weekend! Your blazer is just perfect! What a perfect and chic outfit Justin! So elegant, I love the details!! I think blue is always a good idea! 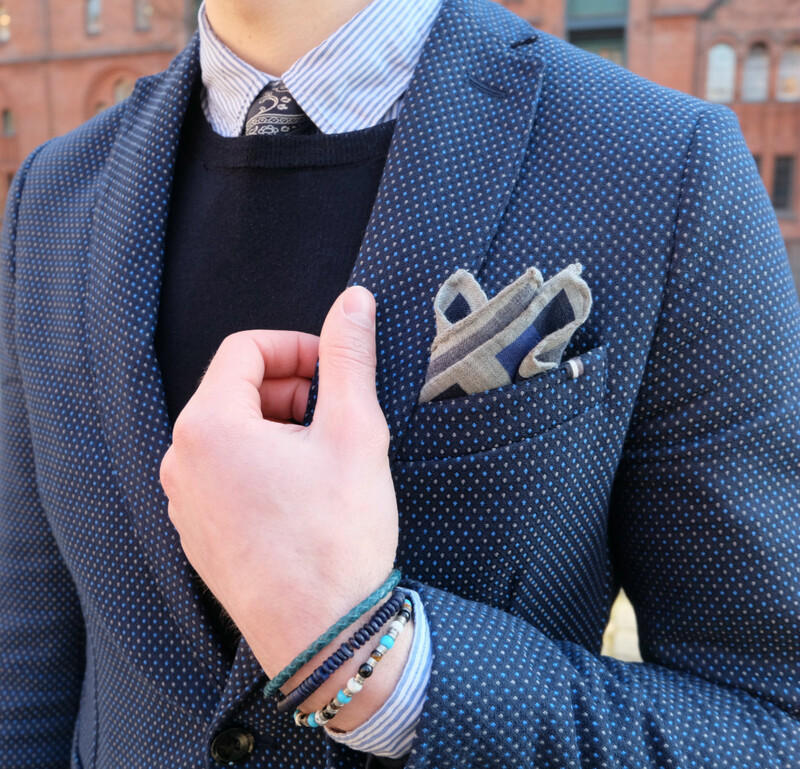 Love your blazer with pocketscarf! 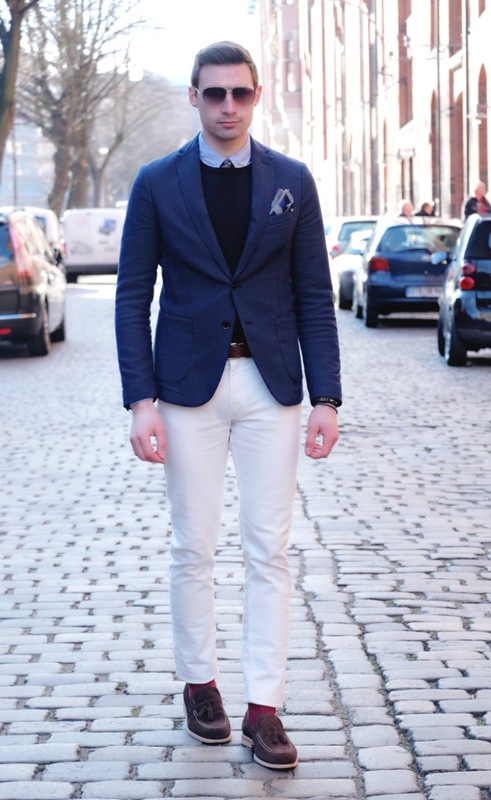 Love the white jeans with the different shades of blue! Have a wonderful weekend, Justin! love love your look! Also the polka dots are very cute! 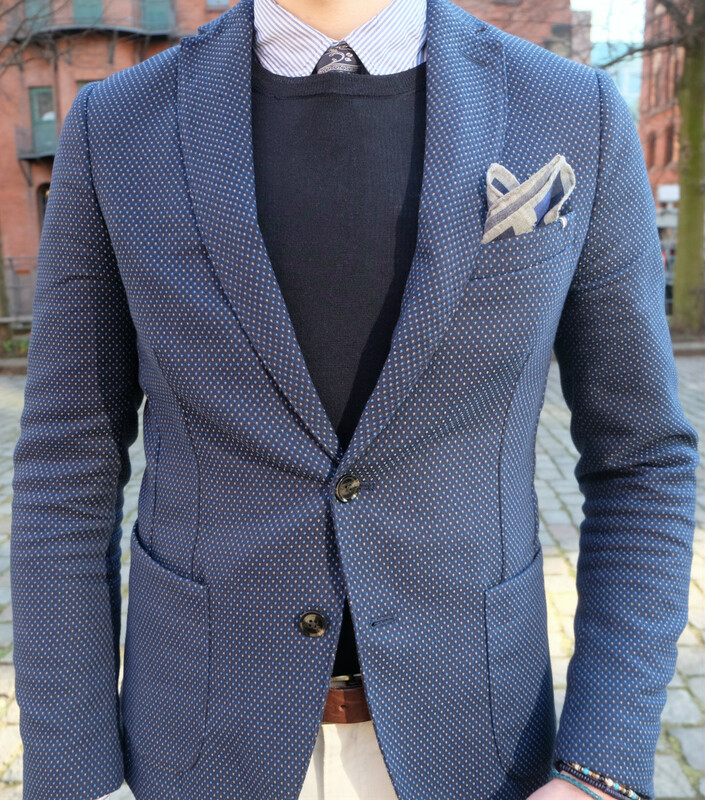 Love your blazer fabric and preppy vibe of your style! Very classy outfit! You look fantastic. Hope you're enjoying living in Europe. White denim is a total must. There's something so chic & fresh about it. I love the jacket, it is super amazing. 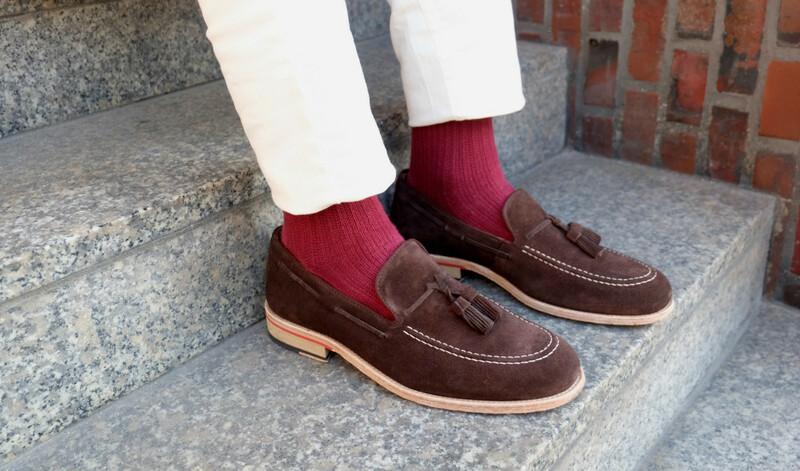 The red socks really caught my eyes, I think they look amazing with those gorgeous brown shoes. The outfit is pure perfection...I agree with what you said about white denim, it makes every look fresh!...and you can't go wrong with blue! Hottttt!!!!! LOVVVE Those red socks! My dad wears red socks everyday!!! So they are special color to us! LOVE The cut of your jacket---sooooo perfect! Amazing look, as elegant as always! I love the jacket and that pocket square. Details! Awesome. Hey!! amazing look!! love this blazer!! great pop of color with this shocks!! kisses!! The detail on the blazer is amazing! At first, I thought you wore two different blazers. I've also developed great love with white pants just recently. However they're a pain to wear because white... ugh... you need to be extra careful not to spill or not to touch anything dirty, etc. Anyway, I love your look! Your blazer is perfection!! Great look!